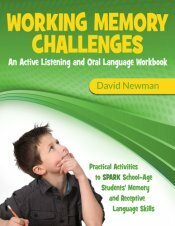 Working memory challenges is a workbook that features active listening activities written by an experienced, practising speech-language clinician, who works in elementary, middle, and secondary schools. Use the activities to prompt memory and receptive language skills in your school-age students. The activities are designed to be used with students from elementary to secondary school. If you have students in your care with a history of oral and written language comprehension difficulty, or who have trouble learning new vocabulary and unfamiliar concepts, then they may have problems with working memory. Working memory has a crucial role to play in school-age students’ ability to learn and retain new information. Targeting working memory skills can have a real and lasting effect on children's memory and receptive language skills and their ability to remember and grasp important information. While working through the activities, your students will in a sense be guided by a clinician who has spent 15 years actually doing this work. The exercises within the book's pages are creative, school relevant and accessible to clinicians, teachers and parents and is presented in easy to follow, non-technical language. Highly engaging printable and photocopiable activity sheets and specific items for each activity. Dozens of high interest questions to prompt students' memory, receptive language and expressive language skills. Entry, intermediate and advanced level questions that gradually become more difficult and challenging. An informal pre-post test to establish a baseline and rating forms to chart your students' progress. A following directions activity that incorporates increasingly complex multi-step instructions combined with a verbal working memory component that targets students' expressive language capabilities. The Working Memory Challenges book will be of high interest to speech-language clinicians, classroom teachers and parents who have children with language and literacy difficulties. This 200 page workbook has numerous activities that will engage your students and promote their critical thinking and memory abilities. Click on the link below to the working memory tasks page which provides a detailed example of one of the entry level tasks scaffolded by the author.